The blind population in India is estimated to rise to 15 million by 2020. Retinal diseases account for a significant share of the vision loss burden, compared to other eye-related diseases that can cause blindness. Of the various retinal disorders, age-related macular degeneration (AMD) and diabetic macular edema (DME) are two progressive diseases that cause loss of vision. AMD and DME can be effectively managed if patients are diagnosed in a timely manner. Therefore, it is important to understand the underlying symptoms associated with the diseases to identify the disease at an early stage. The retina is that part of the eye where the final vision is formed, the way it is created on a film inside a camera. If the retina is damaged, the vision is automatically affected. AMD affects the macula of the retina causing damage to the central vision. AMD is one of the important causes of severe visual loss in the elderly population. It constitutes 8.7% of blindness in the world. 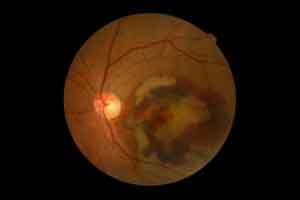 Diabetic Retinopathy damages blood vessels inside the retina at the back of the eye. It constitutes 4.8% of blindness in the world. Diabetic Retinopathy leads to Diabetic Macular Edema (DME) which is the most common form of DR. It occurs when the damaged blood vessels swell and leak into the macula of the retina causing visibility problem in the normal vision. Patients need to be alert in recognizing early signs and symptoms of retinal diseases. Most often, the symptoms of AMD are confused with old age. Diabetics are advised to visit an ophthalmologist/retinologist every six months, as they are at a higher risk of developing diabetic retinopathy. Early detection of AMD and DME increases the possibility of preventing vision loss.